Cost Tournament is $50 per team. Winter Social is free. All alumni are invited to play in the second annual Alumni Broomball Tournament! 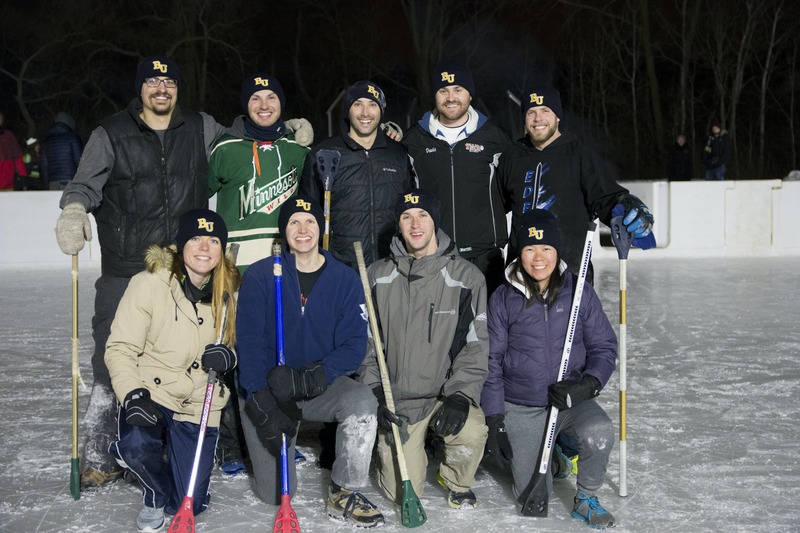 Round-up a team of at least 6 players, come dressed in warm winter gear, bring your own broomball stick, and show up to win (or just come and enjoy hot cocoa, treats, and a bonfire, all while catching up with fellow Bethel alums). The tournament will take place at rinks in the Arden Hills area, leading up to the championship game which will take place on Bethel's on-campus broomball rink. Each member of the championship team will receive a customized tumbler! Cost to enter is $50 per team. Each team must have 6 players to enter. At least 2 players must be women. Each team can have up to 2 non-alumni players. The maximum number of teams for the tournament is 12. If you would like to attend but do not want to participate in the tournament, please register to attend the Winter Social only. The following details assume 12 teams. Adjustments will be made as necessary and communicated to team captains. Team captains are to report to Bethel's on-campus broomball rink at 8 p.m. to check in and receive rink assignments. The first round of games will begin at 8:30 p.m. at the various rinks. We will have 4 pools with 3 teams in each pool. Each game will be played on full ice. The championship game will take place at Bethel's rink. Every team will be guaranteed 2 games in pool play. Each game will be 25 minutes (10-minute halves with a 5-minute halftime). The winner of each pool (determined by the best record or other tiebreakers) will enter bracket play and compete for the championship! If your team must forfeit, please notify the Office of Alumni and Family Relations at alumni@bethel.edu by noon on Thursday, January 24. If your team must forfeit, please contact the Office of Alumni and Family Relations at alumni@bethel.edu by noon on January 24. Refunds will not be issued after January 24. Contact the Office of Alumni and Family Relations at alumni@bethel.edu or 651.638.6462.